Originally developed to combat sea water corrosion, AL6XN has expanded its role as being good mid-range corrosion resistant alloy. AL-6XN torx screws are a low carbon, high purity, nitrogen-bearing "super-austenitic" stainless alloy. With a higher nickel and molybdenum content than Duplex 2205 and Super Duplex 2507, it delivers better corrosion resistance while giving a more cost effective alternative to nickel super alloys like Inconel or Hastelloy in moderately corrosive conditions. 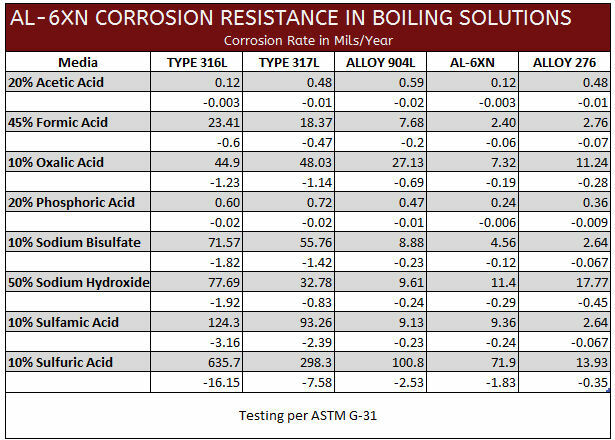 In chemical processes which utilize chlorides, such as paper mills and waste water, stress corrosion cracking (SCC) is a common culprit for 316L stainless failures. 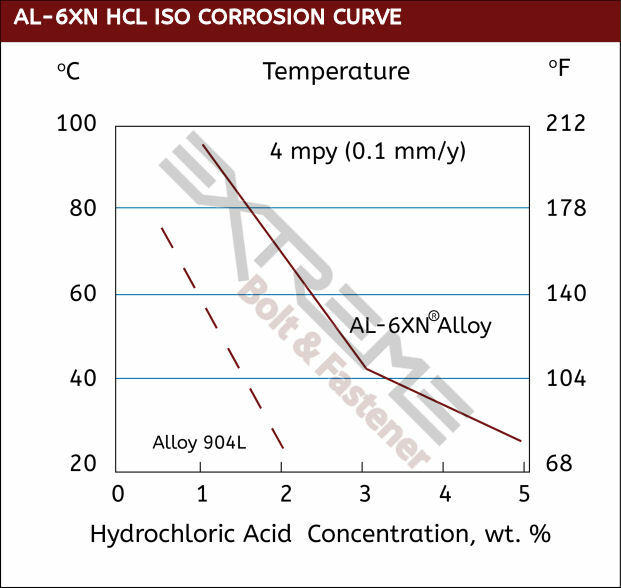 Duplex alloys will outlast environments that will cause SCC in 316 stainless, but for more severe low PH environments, torx screws made from higher nickel content alloys like AL6XN will generally work better. For the most extreme situations, alloys with >45% nickel content like Hastelloy are often considered. Seawater is where AL-6XN torx screws outperform so many alloys providing protection to stress corrosion cracking, pitting and crevice corrosion in a broad range of marine applications. AL-6XN torx screws contain a minimum of 6% molybdenum content and it is this addition of molybdenum that provides the greatest protection against pitting and crevice corrosion. • High molybdenum content provides enhanced corrosion protection in chloride environments. • Chemical Processing - processing tanks, vessels and pipes as well as plate and frame heat exchangers. AL-6XN Torx screws are characterized by a 6-point star-shaped pattern, also called a star drive, spined socket or hexalobular (ISO 10664). Where Phillips heads were designed to cause the driver to cam-out (prevent overtightening), Torx screws were designed resist cam-out. This feature allows AL-6XN Torx screws to provide increased torque as well as better torque transfer between driver and fasteners. This feature also helps to reduce wear on driver bits.